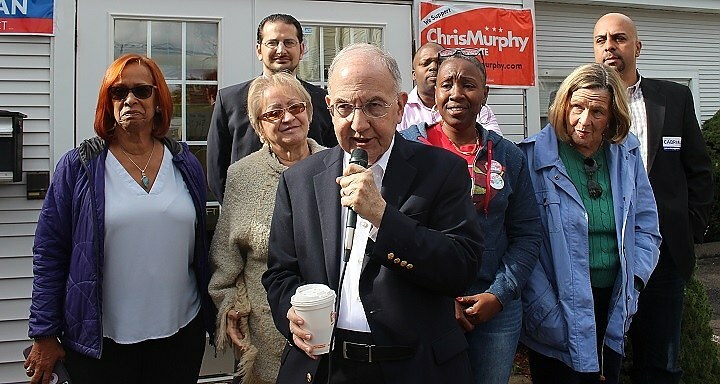 Senate President Martin Looney in New Haven with some of his supporters. Raise the minimum wage. Legalize recreational marijuana. Create a paid family medical leave program. And build affordable housing in the suburbs. Oh, and don’t forget property tax reform. Or school district regionalization. Or criminal justice reform. New Haven and Hamden’s Democratic state legislators have prioritized those goals in some of the hundreds of bills they’ve introduced during the legislative session so far. Since the start of the Connecticut General Assembly’s regular 2019 session on Jan. 9, New Haven-areal legislators have introduced or co-sponsored 314 bills and resolutions. In all, with a newly emboldened Democratic majority in Hartford, the proposals represent the local delegation’s first steps towards enacting a promised progressive agenda, one that aims to redistribute power, wealth, and influence towards the state’s historically marginalized and underserved populations. As the regular legislative session kicks into full gear, the 12 state House and Senate legislators who represent New Haven and Hamden are uniquely positioned to convert these proposals into law, especially since last November saw Democrats retain control of the governor’s mansion and win back control of both chambers of the state assembly, in large part due to New Haven voter turnout. Every New Haven legislator in office holds some position of authority at the Capitol. Martin Looney is the president pro tem of the state Senate. Rep. Toni Walker is the House chair of the Appropriations Committee. Sen. Gary Winfield co-chairs the Judiciary Committee. Rep. Robyn Porter co-chairs the Labor & Public Employees Committee. Rep. Roland Lemar is the House Chair of the Transportation Committee. Rep. Al Paolillo is the vice chair of the Public Safety and Security Committee. Rep. Juan Candelaria is the deputy speaker of the House. And Rep. Pat Dillon is the House Democrats’ assistant majority whip. The same is true for Hamden’s delegation. Rep. Mike D’Agostino is the co-chair of the General Law Committee. Rep. Josh Elliott is the assistant majority leader in the House and the vice chair of the Commerce Committee. And Sen. George Logan, the lone Republican from the area, is the co-chair of the Planning and Development Committee, the vice chair of the Public Health Committee and the Veterans Affairs Committee, and the Senate Republican majority whip. Some of the proposed laws reflect years of legislative effort. Some are new and specific to the current political moment. Thanks to New Haven and Hamden legislators’ positions of prominence in Hartford, at least some have a chance of actually becoming law before the regular legislative session ends in June. Following are some of the ones to watch. In New Haven, taxable property can be hard to come by. Roughly 55 percent of properties in the city are off the tax rolls. That property, much of it belonging to educational and medical institutions and other tax-exempt nonprofits, is some of the most valuable land in the city. Mayor Toni Harp and her budget team have spent a good part of the past year arguing that the city’s recent 11 percent tax increase, credit rating downgrade, and negative $11.09 million overall fund balance are due primarily to flat and/or falling state aid, which makes up roughly 48 percent of the city’s general fund budget. A handful of bills proposed by the New Haven delegation, and in particular by its head, Martin Looney, take aim at that very property tax revenue conundrum. The proposed bill, which has been referred to the Committee on Finance, Revenue, and Bonding, would establish a $50,000 homestead exemption to the assessed value of one-to-four family, owner-occupied homes. Since properties in Connecticut are assessed at 70 percent of market value, property taxes would then be applied at the assessed value minus $50,000, which would provide the greatest relief for families with lower value properties. As for raising revenue, the proposed bill would establish a 1 mill state-wide tax on real property, with a mill equal to $1 for every $1,000 of taxable value. It would also replace all municipal car taxes with a single state-wide car tax set at between 15 and 19 mills. New Haven’s car tax is currently at around 42 mills, while Greenwich’s is 12 mills. The proceeds raised from the state-wide property tax and the state-wide car tax would then go towards funding the Payment in Lieu of Taxes (PILOT) program, which reimburses cities like New Haven for revenue lost out on through tax-exempt. The bill also would direct new revenue towards special education grants and other education and alliance district grants. But S.B. 431 isn’t the only proposed bill from Looney that seeks to beef up the city’s tax coffers. S.B. 788, or “An Act Allowing Municipalities To Impose A Property Tax On Certain Facilities,” would allow municipalities to impose a property tax on outpatient hospital facilities that generate income for hospitals. Which would include Yale New Haven Health (YNHH), the nonprofit health system that includes Yale New Haven Hospital, Bridgeport Hospital, Greenwich Hospital, and several others. In Fiscal Year 2017, YNHH had over two million outpatient encounters and generated a total of $4.3 billion in revenue. That proposed bill, which was also introduced by fellow local House representatives Walker, Porter, Candelaria, Lemar, Paolillo, and DiMassa, has been referred to the Joint Committee on Planning and Development. And Looney’s S.B. 475, or “An Act Increasing the Sales Tax Rate And Dedicating The Additional Revenue To Municipalities,” seeks to redistribute state dollars to New Haven via another avenue: the sales tax. That proposed bill, which has been referred to the Joint Committee on Finance, Revenue and Bonding, would increase the sales tax rate by one-half percent, from the current rate of 6.35 percent to 6.85 percent. That new revenue would then be sent right back to the municipalities where the sale took place. Also at last week’s legislative agenda forum in Hamden, Looney singled out a proposed bill that would consolidate small Connecticut school districts, thereby working towards a goal of regionalizing government services, which Gov. Ned Lamont promised to prioritize when he won the Democratic Party primary in August 2018. That bill, S.B. 454, or “An Act Concerning The Creation Of Regional School Districts,” would create a commission responsible for putting together a plan for the regional consolidation of smaller school districts. 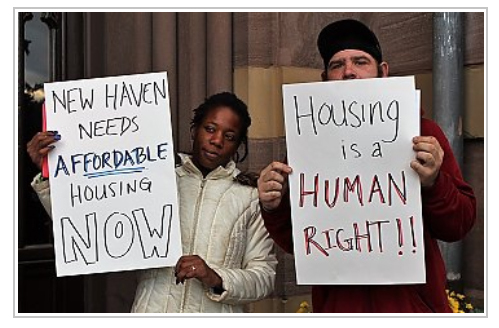 New Haven State Rep. Roland Lemar has taken the regionalization of services goal beyond education with a handful of bills that encourage the development of affordable housing not just in urban centers like New Haven, but in surrounding suburbs as well. That bill, which has been referred to the Joint Committee on Housing, would allow a housing authority to expand its area of operation to include “high and very high opportunity census tracts” within a thirty-mile radius of the municipality where the authority was created. That would allow Elm City Communities, New Haven’s housing authority, to build government-subsidized, low-income housing developments in wealthier surrounding towns like Bethany, Branford, and Guilford, which combined contain less than 10 percent of the region’s affordable housing units, in comparison to New Haven’s 31 percent and Meriden’s 16 percent. In that same vein of encouraging affordable housing development outside of New Haven, Lemar has introduced H.B. 5273, or “An Act Concerning As Of Right Multifamily Housing Zones.” That bill, which the Joint Committee on Planning Development has reserved for a subject matter public hearing, would allow multifamily housing developments to be built as of right within one-half mile of all fixed-route transit stops throughout the state. That would mean that developers could build denser housing closer to bus and train stops statewide, including up and down the recently launched Hartford Line commuter rail, which former Gov. Dannel Malloy hailed as a harbinger of greater transit-oriented development throughout Connecticut. Lemar has also put forward H.B. 5421, or “An Act Concerning The Recommendations Of The Fair Housing Working Group.” That bill, which has been referred to the Joint Committee on Housing, would amend state law to include recommendations made by the bipartisan, legislative Fair Housing Working Group regarding the expansion of housing authority jurisdiction, statewide affordable housing requirements such as inclusionary zoning mandates, and the establishment of a transit-oriented development planning task force. Of the over 300 bills the New Haven delegation has introduced over the past three weeks, roughly a quarter are geared towards reducing the cost of health care and protecting patients from insufficient insurers and pharmaceutical companies. One such law, S.B. 48, or “An Act Reducing Prescription Drug Prices Under The Medicaid Program,”would require the state Commissioner of Social Services to establish a price cap for prescription drugs, and then conduct additional negotiations for rebates whenever that cap is exceeded. Looney has also introduced bills that would prohibitcopayment accumulator programs, ban short-term health insurance plans that don’t cover essential benefits, and require manufacturers of brand name prescription drugs to provide samples to manufacturers of generics. Two bills proposed by local representatives call for the creation of a public health insurance option, though neither bill details how that option would be structured or how it would compete with private insurers. In the Senate, the bill,S.B. 32, has been introduced by Looney, and in the House, the bill, H.B. 5722, has been introduced by Dillon, Lemar, Elliot, and 20 of their House colleagues. Similarly lacking in details for now but frequently introduced by local legislators are three House Bills and one Senate bill calling for the establishment of a paid family medical leave program whereby workers can take paid time off to care for sick family members. A bevy of local legislators are also behind one Senate bill and two House bills that would raise the the state minimum wage to $15 per hour, as well as one House bill and two Senate bills that would prohibit “captive audience” meetings in which an employer requires a worker to attend a meeting to discus political or religious views.